Mary Manson Muir ORMSBY was born on 14 August 1896 in Brickrow Farm, St. Quivox, Ayrshire, Scotland. She was the second of John and Helen Ramsay [MUIR] ORMSBY’s children. Her given name Manson was after her maternal great-grandmother Jane MANSON who died six years previously at Mainholme Farm in Ayr where Helen’s parents [James MUIR and Helen McNAB] lived. Mary died at age four on 30 July 1900 in Brickrow Farm. Cause of death was scarlet fever, a contagious childhood disease. Until vaccine was developed for scarlet fever in 1924, it was a major cause of death. Mary’s sisters Helen (Nelly) [Helen McNab Steel ORMSBY], Jane (Jean) [Jane Muir ORMSBY] and Jessie [Jessie Ross ORMSBY] were all young children at the time and there would have been concern that they would die of the disease as well. 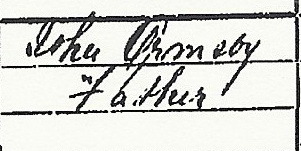 Below, Mary’s father John ORMSBY signed her death registration on July 30th 1900.